That's most evident on the level of plot. Without giving too much away, I will say that The Force Awakens often feels like a re-imagining of the first movie, with a little bit of Empire and Jedi thrown in. Even the characters sort of match up: Daisy Ridley's Rey gets the Luke role, while Oscar Isaac's Poe Dameron is a Han Solo type, with a bit of Leia thrown in. Adam Driver's Kylo Ren is a new Darth Vader, complete with his own inner torment and family issues. (He's got his own Emperor, too, in Supreme Leader Snoke, and his own Tarkin in Domhnall Gleeson’s General Hux.) Harrison Ford's Han Solo gets to be aging-mentor Obi-Wan this time around. BB-8 is basically R2D2 and Lupita Nyong'o feels like a variation on Yoda. There's a Tatooine-like planet that's not technically Tatooine, a new Death Star that's not technically the Death Star (it’s called Starkiller Base), there's a cantina scene, there are plans hidden in a droid, and so on and so forth. To say more would really spoil matters, but you get the idea: It's a Star Wars mix and match. That said, the mix is pretty wonderful. Abrams has a deft shorthand with character -- revealing it through action without having to stop and explain too much. He shoots his action scenes close, and he keeps them fast. He keeps the dialogue fast, too -- a lesson Lucas learned on the first Star Wars film but seemingly forgot in the Prequels. And he deploys humor nicely, even allowing it to undercut the film's more earnest moments. (“Why are you doing this?” “Because it’s the right thing to do.” “You need a pilot.” “I need a pilot.”) The actors are appropriately breathless, and surprisingly physical. Daisy Ridley has intensity to spare and a kind of haunted, brittle aura, which helps temper her character's more predictable qualities. Oscar Isaac turns out to have the dash and charisma of a young Harrison Ford; if he wasn't already in a Star Wars movie, he'd make a fine candidate to play the young Han Solo in the planned spin-off. Adam Driver doesn't get to use his face much, but his rage is white hot and compelling. If Darth Vader was the master of the lumbering slow-burn, Kylo Ren charges around with a constant chip on his shoulder. The most interesting of the new characters is probably Finn, or FN-2187 (John Boyega), a young Stormtrooper who has a crisis of conscience early on and winds up joining the resistance. Raised from very early on to be a faceless, mindless killer, he has no idea who he actually is. This is the only one among the new roles that feels like an original – an existential Star Wars character, whose life is a complete blank slate. And Boyega does a nice job balancing the character's befuddlement and very real fear with his growing dedication to his companions. Every character in this film is looking for belonging of a sort, but he’s the only one who seems to understand that belonging isn’t always a good thing. 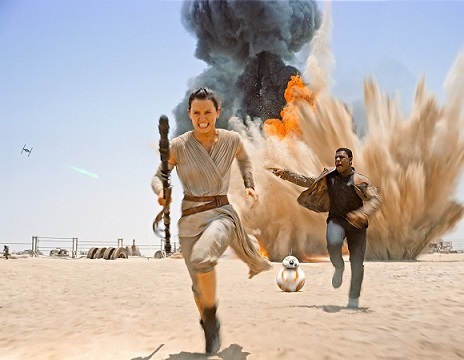 The Force Awakens isn't particularly imaginative – it’s missing the more dreamy aspects of Lucas’s better work, and yes, even a bit of the spectacle – but it's very exciting and involving. Abrams showed in his Star Trek films that instead of creating whole new worlds, he's better at exploring existing ones. And so, there’s a tactile quality to this Star Wars that's very welcome after all these years. We learn a little about what Stormtroopers do after they get back from massacring a village. We find out that Tie-Fighters get locked in for the night. And when two of the characters in The Force Awakens come across the old Millennium Falcon, they have to contend with its clunky swivel seats, its outdated display screens, its unwieldy navigation, its thundering cannons. It’s probably the kind of thing every kid raised on Star Wars has wondered about at some point – what it must be like to sit in the Millennium Falcon. In moments like these, one senses the joy that Abrams -- one of those very kids -- must have felt making this thing, and he transfers that same joy to his audience. Bilge - I love your movie writing, and I'm delighted to belatedly discover this blog (named after a movie by a former professor of mine). I have one slight quibble, which has actually been bothering me since 1981. With Star Wars, and especially with Raiders of the Lost Ark, there was a lot of talk about Lucas and Spielberg reviving the spirit of the serials of their youth. Those two guys are less than a decade older than I am, and I can tell you from my own experience that movie serials (Flash Gordon, Capt. America, Batman, etc.) were a thing of the distant past. And I was a big movie nerd living in a big city, with access to all kinds of high and low culture. I can't imagine that it was that different a few years earlier. So all this talk about Raiders and Star Wars reminding audiences of the serials of their youth was something I never understood.